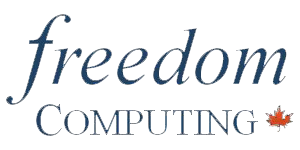 Freedom Computing was a Business Partner for Commence Corporation for more years than I care to remember, and I sincerely thank all of those customers and associates who made the ride such a great one. But times change and people change, and we are no longer the Commence power that we were for all those years. We have a couple of computer customers left that we continue to take care of, but we have pretty much moved on to greener pastures. Computers and applications are now tools for us, rather than products, and we have dusted off the artistic side of our brain. And we are enjoying it tremendously!